One of my favorite family traditions is our annual Back-to-School dinner. I always make something special to celebrate the new school year. This year was no exception. I remember being a kid and my mom buying us chocolate chip cake from a little lunch place in my hometown. I loved this cake. I had completely forgotten about this cake until now. I needed to recreate this cake from my childhood for my children. I did some Googling, and there really was not a cake out there like I remembered. Lots of chocolate chip bundt cakes, but none that were exactly right. How hard could it be? Here’s the thing, when I get an idea in my head like this, I can’t sleep until I figure it out. The first cake that I made was a typical yellow cake with the addition of mini chips. I floured the chips and even with that precaution, the chips sunk to the bottom and it became an upside down chocolate chip cake. While it tasted good, it was not the cake that I remembered. And let’s be honest – hardly a show piece. The second go-round was the winner. I used the Perfect Pound Cake recipe from my favorite baking book, Baking. I knew that the recipe would not be enough to fill two cake pans, so I did one and a half batches of batter. The recipe below is what I used to make this cake. It was exactly like the cake that I remember. When I posted the pictures above on Instagram, I got the question, “how did you get the cake layers so flat and perfect looking?” My secret is Bake Even Strips. You get them wet, wrap them around your cake pans, and put them in the oven. I like to put my cake pans on a baking sheet, but it is just because it is easier to get them in and out of the oven. The strips do not burn, and it works every time. I have also done it with strips of old towels. Same thing – get them really wet, and tie them around the pans. Bake as normal. edited – This cake has had mixed results from some of the commenters. I appreciate them sharing their feedback with me and I am sorry that some were disappointed. I know how frustrating it can be to spend the time baking something and not have it turn out the way you expect it to. Some have had a very dry cake. This cake is a pound cake, so it is not going to be light and fluffy like a cake mix. But it shouldn’t be super dry either. My suggestions – be careful to not over-bake. I would take it out when the toothpick still has a few moist crumbs on it. It will continue to bake even after it comes out of the oven. If it is dry, you can brush the layers with a simple syrup to add moisture. This is a bakery trick that helps cakes stay moist. Preheat oven to 325 degrees. Spray 2 (8-inch) cake pans with cooking spray with flour. Whisk together flour (take out 2 Tablespoons of the flour), baking powder, and salt. Add the two Tablespoons of flour to the chocolate chips, and toss to combine. This helps the chips stay where they need to be, and not sink to the bottom. Slowly add the flour mixture, and mix until just incorporated. It is not a bad idea to add the last bit of flour by hand. You want this cake to stay tender and over-mixing toughens it up. Pour the batter evenly into the prepared pans. I insulate mine with baking strips and put them on a baking sheet. Bake for 35 to 45 minutes. Check on them around 30 minutes. If they are getting too brown, loosely tent some foil on top. The cakes are done when a knife comes out clean. Let the cake cool in the pans for 10 minutes. Turn the cakes out and let cool completely on a wire rack. To make the frosting, cream the butter and one cup of powdered sugar. Slowly add the remaining sugar with the mixture on low speed. Add the vanilla. Add the heavy cream, and beat on medium-high speed until light and fluffy. Lay one layer on a cake plate, and add about 1 cup of frosting. Spread evenly and add the second layer. Frost completely. To make the frosting, cream the butter and one cup of powdered sugar. Slowly add the remaining sugar with the mixture on low speed. Add the vanilla. Add the heavy cream, and beat on medium-high speed until light and fluffy. Add chocolate chips. Lay one layer on a cake plate, and add about 1 cup of frosting. Spread evenly and add the second layer. Frost completely. The cake is gorgeous! What a fun dinner! Thank you Maria, it was fun to make! This is stunning! I bet everyone loved this treat after dinner! Thank you! We all loved this cake. I like crunch from the chips. I am really excited to make this cake, but I noticed you have 2 different baking times. In the step-by-step with pictures you say 30-45, but in the condensed version it says 60, but to check at 30. Which do you follow? Also, do you use all purpose flour or cake flour? All-purpose. And I’ll fix it. It is 30 minutes. It’s beautiful! What a perfection! Bree, your cake looks fab..I’ll be making this one!!! Your photography and plating skills are amazing..love your blog!!! Geri!! thank you so much Geri! I appreciate it. can you bring this to me on the night before the first day at my new job later this month? that would be great 🙂 miss you, friend! I have been waiting for you to post this recipe since I saw it on your instagram! Can’t wait to try it! Hahaha! I hope you like it! Oh my goodness! Must make this cake soon! Such a beautiful cake! I love everything about this cake, really. It looks perfect and I am so jealous I am not apart of your family, just so I could eat this cake with y’all. You can come over any time! I will make you any kind of cake you want! I love the frosting on this cake! Awesome! I like the crunch from the mini chips. This cake was fun to make. I am so behind and now catching up on your site. This cake is gorgeous, and so special. Thinking I need to make just because like cake. Thank you Denise! I hope you do, I loved this cake. It was fun to make too. I love a good chocolate chip cake! I’ve only tried once before and had all the chips fall to the bottom- I can’t wait to try it with this recipe. And as for the baking strips? They’re now on my Christmas wishlist! You will LOVE the baking strips. I am totally loving this cake – add a scoop of chocolate chip ice cream on top and it’d be the perfect combo! That is one amazing ingredient. stop this looks so so good- like a giant fluffy chocolate chip cookie cake. need to find an excuse to try this soon!! You don’t really need an excuse. Thank you Susan! I think everyone will love this! This cake looks amazing! Told my 5-month pregnant daughter and she’s ready for me to come for a visit. Bree, you do make some of the most amazing cakes. I’ve made your Funfetti Cake, your Orange Creamsicle Cake, and know this one will be another hit! Thank you! I love making cakes. I have to be in the mood to do it, but love it when I am in one. Oh, and the clever way you frosted the layers. Would this technique work for other cakes, too? Absolutely! It is how I always frost cakes. I saw this cake on pinterest. It looks fabulous! It’s a little dainty looking, so imagine it’d be perfect for a tea or something pretty. Going to make it soon! Gorgeous cake, Bree! I just want to dive head-first into that frosting! thank you Abbie! I love this cake too. Chocolate Chips anything is my favorite so I am excited to try this. Any recommendations on if I wanted to turn this recipe into a cupcake version for a shower? This should be fine as a cupcake. It would be a delicious cupcake at that. Thank you so much for creating this recipe! It was so easy to make based on your step by step instructions! 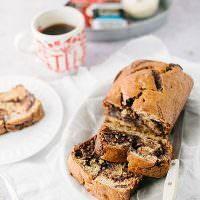 It tastes just like a cake a remember from my childhood, that I could never find a recipe for…..now my only regret is not packing a slice to bring with me to work today!!!! 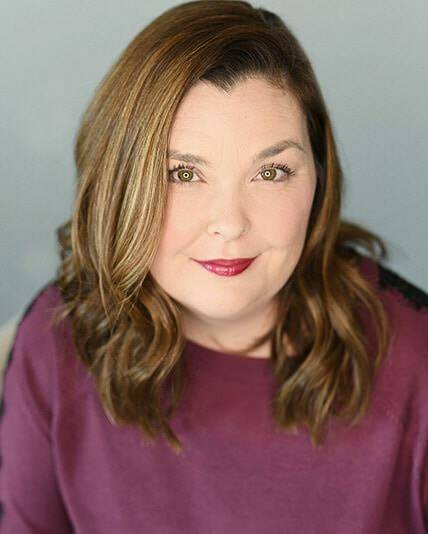 I am so glad Krissy! I love this cake too. My friend loves pickles and every year we have a pickle party for his birthday. I added green food coloring and some espresso to the icing, and made him a “pickle cake.” The chips in the frosting contributed the “pickle texture.” I lined the cake with baby gerkins, it was adorable. People were grateful that it didn’t taste like relish. I have this cake in the oven now, but the batter was very thick and the cake does not seem to be rising much. Is there supposed to be any liquid in the recipe other than the eggs and vanilla. No there isn’t, it is a pound cake, and it will be dense. Hi, how do you frost your cakes? Why do they always look so perfect!? An offset spatula. And a lot of practice. I had a job in high school decorating cakes. Did you use cake flour or all purpose flour? I’m assuming all purpose flour, right? All purpose. I use AP unless it says otherwise. This was the PERFECT cake for my husband’s birthday! It was easy to make and looked professionally done. It came out exactly as promised with the chocolate chips perfectly blended and the cake light and fluffy. My children were delighted with the chocolate chips and my husband was impressed with the presentation. I was impressed with your simple ingredients, easy-to-follow instructions and beautiful pictures. Bravo! Yours is officially the very first baking/cooking website I have ever bookmarked! Can’t wait to try more! I am so glad Amanda! Thanks for bookmarking me! I made this for my sister’s birthday party since it looked delicious. I mean, you can’t go wrong with chocolate chips! I was dissapointed with the results though. The cake baked well and it presented very nicely( chocolate chips did not sink) but it was too dry. I know pound cake it not supposed to be moist and fluffy but I don’t want it to be too dry either. It got mixed reviews from our guests and some even said they thought I made it dry on purpose. Note: I followed the recipe exactly. The frosting was good. I think my former comment didn’t get published. I wanted to give my review since I thought it would be helpful. I enjoy reviews from people who actually tried the recipe. I made this for my sister’s birthday last week since I thought it would be a good cake for a mixed crowd. The cake turned out beautifully with the chocolate chips dispersed throughout as promised. Unfortunately, the cake came out dry even though I did everything the recipe said. I really wish it would have turned out better since its a great looking cake. Sorry that you did not enjoy it. What a fun idea! The pictures look lovely. Looking forward to trying this. This is one gorgeous layer cake. Pinned! Thank you. 9-inch and a bakery supply store. Yum! I’m making this! How could it not be delish?! Thanks for sharing. I found you on Pinterest. I’m a new follower through Twitter. Oddly, my cake came out very dry as well! I think the issue was in the bake time. Every oven is slightly different. I pulled my cake out at 35 minutes and it was honestly bone dry. It was so dry that we poked small holes in the slices with a toothpick and then drizzled over half and half (which, in case you’re wondering, helps!). I think the key is to really keep your eye on the cake. I believe if I’d taken it out of the oven at 25-30 minutes that the cake would have been fine. It looked spectacular though! Pound cake is never moist. It may be bake time, but it is not going to be a light and fluffy cake. I had the same issue as a fee other people. I followed the directions exactly and the cake looked amazing and honestly tasted good but it was so dry I threw it away. Any suggestions on making it a bit more moist? I know it’s a pound cake and won’t be super moist but any ideas would help. Thanks! I am sorry that this is happening. I would start by being very careful to not overcook it. The toothpick should be on the moist side when you take it out of the oven. It will continue to cook a bit after it comes out. My second suggestion is to brush the layers with a simple syrup. It is a bakery trick that helps keep cakes moist. Hope this helps! Hi! I’m wondering if you could offer some advice. I want to try this again and get it right this time! I followed the directions precisely, but the cake did not rise much. It is about half the height of yours! What should I try differently? I also took it out at 40 minutes as it seemed totally done! Would the strips help? Maybe I should get an oven thermometer and check temp? TY! This cake is simply gorgeous! The first thing that I would try is to make it again with fresh leaveners. I replace mine every other month or so, even if I have not used it all before then. Ovens vary, mine runs slow, so it is done when it is done according to your oven. You can get a thermometer to see, it is worth doing. Tommorow is my husband’s birthday and I want to try this recipe soo very badly! But I don’t want to make with the same amount. I want just one cake. So should I just take half of everything in the ingredients? Because you mentioned you had made it one n half. So could you please let me know the exact recipe to make just one cake and a frosting for dat?Please..
Love your blog! Reached here late but iam gonna follow it from now on! Great job! If you are making a layer cake like mine, you need the full recipe. If you are making it in a loaf pan, then you could halve the ingredients. The bake strips are amazing. This cake is not light and fluffy like a boxed cake, just an FYI. I just made this cake for my grandson’s 6th birthday, and a serrated knife was needed to cut through it, how embarrassing. I followed the recipe to the letter, so what did I do wrong. I am sorry, my guess would be overbaked. It is a pound cake, so it is not a light and fluffy cake. I made this today and was pretty bummed 🙁 Turned out like a brick, just like the woman above said. I only baked it fifty minutes but I guess that was too long. I am sorry that this recipe is proving to be difficult. I just made this recipe….it seems very greasy. Is it possible that there is a typo under cake ingredients and its supposed to only be a stick and a half of butter, not a cup and a half like it says? I’m sorry, it was my mistake. One of those days…. I hope that your day improved! Great! So glad that you liked it so much. This looks amazing! Wag size cake pans are you using? Your cakes look taller than a standard 9″ pan. Hi Bree, my cakes are in the oven now, fingers crossed! I baked two 9″ rounds, but noticed that the directions call for two 8″ rounds. I’m not sweating it, but not sure if the cake will be even more dense with two 9’s?! I have made your sprinkle (fun fetti?) cake and just love it. My hope was to take that recipe, omit the sprinkles and lemon and add the vanilla and chocolate chips instead. I chickened out, but thought I’d run it by you? I love a moist cake and nothing beats your sprinkle cake recipe. Thank you for sharing your wonderful recipes with me! I tried that, but the batter wasn’t thick enough and the chips all fell to the bottom, even when I floured them. Hi Bree! It’s my mother’s birthday next week. it was my birthday in january and we made chocolate cake (with salted buttercream frosting-oh yeah!) and it was my sister’s in feb and we made yellow cake with chocolate buttercream. and now its momma’s birthday and I am looking for a cake that is a little out of the normal from the typical yellow and chocolate since we had just done that and i was thinking of a pound cake. i remember you posted this cake awhile back. it looks really good. I have a question for you, though….it is hard to tell by the photos about how dense the cake is…my mom likes her pound cake pretty dense and moist…how would you say this cake matches up? It is dense and not super moist. I would not say that this is the cake. If you bake it loaf style it seems to stay moister, but as a layer cake it is a pretty solid cake. I was just curious what brand bakeware you use? Im in need of some new cake tins and would like your recommendation? That’s a good question. I bought these pans at a bakery supply store and they are not labeled. They are really heavy and have high sides. I love them. I have seen similar ones at Sur la Table, but I am sure that mine were less expensive. I cannot wait to make and try this. Seriously I think it is going to be my dinner. Hi, I would like to know how many people can eat from this cake? I’m having a birthday party and I would like make this cake! Sorry I didn’t get to this sooner, but towel strips drenched in water. I baked this cake twice. The first time it was really really dense. Maybe I over mixed it. It was still yummy. i poured milk over my slices and it was yummy. The second time I decreased baking time, gradually mixed in flour and added some milk. Very yummy. Looks delicious. Since it is a pound cake, I think I will make it in the traditional tube pan and drizzle chocolate over the finished product. Thanks for sharing! Amazing cake! Mine turned out perfectly. Thanks for the great recipe! I made this cake for my roommates birthday. I followed instructions exactly and noticed the mix was very thick and not pourable in the slightest like most cake mixes are. I guess this should have been a sign that it needed more moisture. I cut the baking time to 40 minutes. My toothpick came out completely clean so I popped the layers out and let them cool outside of the pan. My cake looked EXACTLY like the photos from the post but sadly, my cake was very dry. I would not recommend making this cake. The frosting was fine so if you want to make it look like this, a box mix would work better than this cake did. I understand it is a pound cake and not meant to be super moist but this was much dryer than a typical pound cake. It was simply not enjoyable. what a fun, yummy cake! I made this cake for my grandson and it turned out perfectly once I adjusted the baking time. The suggested 50-60 minutes would be fine for a traditional pound cake baked in a Bundt pan. It is entirely too long for a layer cake–even a dense one. I baked it 35 minutes and turned out two lovely browned layers. Speaking of turning out, I only waited 10 minutes to remove the cake from the pan.. In 30 minutes the pan is too cool and the shortening hardens making it difficult for the cake to release. This cake seems amazing and would really like to try it but what if my oven can go to a max of 250 deg only? I can’t promise that it will turn out. I have never seen an oven that only goes up to 250 though, I am baking in F not C.
Thanks for this recipe, just tried it yesterday for the first time and it turned out brilliantly. Followed your tips about not overbaking it (it is quite a dense cake but I still like it) and the heavy cream (I used double cream as I live in the UK) made it extra creamy. The 375 Farenheit was a tad too hot for me though, that equals 190 Celsius and I usually bake at 180. Thanks though! I tried this recipe today. it turned out awesome. thanks for sharing the recipe. I added little milk. I use 2″ inch pans. This recipe can be iffy for some people, I would do a test run before you commit to a whole cake. I love this recipe and have never had a problem, but if you read the comments, some people have had issues with dryness. This is the worst cake I have ever made. It is like eating saw dust with chocolate chips in it. I think you need to revise this recipe. There is clearly something wrong with it. What a waste of a lot of ingredients and a lot of money. I’m going to try to make this recipe for my co-worker’s birthday, but would like to try it in cupcake form. Do you have any tips or suggestions? Should I reduce the recipe? I don’t think that these would be a good cupcake. I’m so glad I found this recipe. I was a baker before my SAHM days and have a hard time finding recipes for cakes. We are having a party for my daughter’s birthday in a couple weeks, I planned on making a 10″ double layer round. Do you think increasing the recipe by 25% will suffice? Also wondering if it would be too dry having had to bake longer than an 8 or 9″?? I need to warn you, this cake can dry really quickly. I’m not sure that this is the best recipe for that. The frosting, definitely! Oh my lord this cake. I live at high altitude so i added a little bit of extra flour to help with that. I also used cake flour, that really helps for a lighter cake. I also used egg whites. 6 of them, and only two egg yolks. I beat them by hand with one tsp cream of tartar and folded them in in the end and it was beautiful. (I made the entire thing by hand.) Thank you for the recipe! I am trying to find a chocolate chip cake recipe to make cupcakes. Since this is a pound cake recipe, have you or anyone attempted this recipe with cupcakes? Thanks! I haven’t tried this myself. I’m sorry that you were disappointed, but I also stated that it was heavy and that you should brush with syrup in the headnotes. I recommend that you read the post completely in the future. I don’t know if this was already pointed out, but your instructions under the pictures are different from what is in the recipe box, for the cooking time. I think that might be contributing to the dryness? I made this cake for my son’s 8th birthday, at his request. The cakes were dry when I took it out of the pan. I cut the crust off of the entire two cakes. Let it cool slightly and wrapped them in plastic, hoping they would soften with moisture. I gave them about 7 hours at room temperature. No luck. I iced them and put the cake in the refrigerator. We sliced and enjoyed. It was delicious. However, I let the cake sit at room temperature in a covered cake stand and the moisture came to make it taste much softer the next day. My opinion: skip the refrigerator! This recipe’s so good, you don’t have to worry about keeping it out for too longer because there won’t be any left by the third day! This cake was delicious! skip the refrigerator and keep it room temperature! As I mixed the ingredients, I noticed the mixture was pretty dry. I decided to add some milk until I got a nicer consistancy. After reading the comments, I’m glad I decided to do that. Also, I left the cake in the over for 40 minutes instead. It came out perfect. A friend of mine knows someone who makes the most amazing chocolate chip pound cake I’ve ever tasted. I’ve been wanting to try to make it myself, so I searched the Internet for something similar. I finally got around to trying this recipe today, and I must say..I was a little disappointed. I made sure to read through the directions and comments thoroughly before even attempting to make this cake, so I was very careful to follow the directions perfectly and I made sure not to over mix the batter or over-bake the cakes, as the post and comments said. I took the cakes out when they appeared to be done to the posts specifications, yet they still managed to be slightly dry. I decided not to brush it with syrup because it was already sweet enough as is.. I’m aware that this is a pound cake and is not meant to be light and fluffy. But my cake was so heavy and dense it’s almost hard to eat. I hope it softens up a tad after a day..i don’t want my entire day and all of this cake to be nothing but a waste..
Maybe you should ask your friend for the recipe that you love so much? Sorry you were disappointed. Completely over the top! Made per directions in 2 nine inch rounds, baked for 35 minutes and cooled in pans for 10 minutes. Kids said they loved it. I did, too. Very rich, some couldn’t finish their slice. Note to cut smaller pieces! The frosting is simply to die for. I personally like this dense butter cake and that consistency. I left the cake out for a few hours before serving and the frosting was soft and creamy. Oh geez, that’s good! I love butter. Hello! I´m from Brazil and I haven´t found the baking stripes yet. But I tried to follow the recipe. Mine was heavy… I was expecting it to be flufy and soft. Do you think my oven was too hot? Thanks for the recipe! It could be a lot of things, but it says in the head notes that it is not a soft and fluffy cake, but more like a pound cake. I’m sorry you didn’t enjoy it. I need to make it in a 13 X 9 pan. Will that work? I’m going to buy baking strips and my pan is also the insulated type. 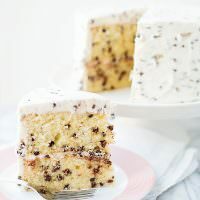 I plan to make 2 of them and ice them side by side for a party, it won’t be a layer cake….I just love cake with chocolate chips so I thought I’d try this, I like pound cake too! I don’t know. I’ve never made it in that size pan. This recipe was weird for me. The texture came out like cornbread, despite me only baking it for 40 minutes. So strange. Do you think this would work with white chocolate chips? My little guy is turning 8 this week and has requested white chocolate chip cake! It should. Make sure to flour them. Made this for dessert tonight and it was just awful! Followed the recipe exactly and the cake was so hard and dry that we could barely cut it. Only good thing is it made for a lot of good laughs. Think about feeding it to the birds. I used the same amount of batter for 2, 6 inch (3 inch high) cake pans and ended up needing to bake for over an hour! Can’t wait to bake this again, possibly in cupcakes! Ps. The tip for tossing chocolate chips in flour works so well! I’m do glad that you like it so much.